For visitors that arrive during the warmer months, outdoor concerts by the sea, epic road trips with local wildlife as scenery, and thrill-inducing amusement parks await. Those traveling during the colder months can experience historic ruins, tax-free shopping, and historic art museums. 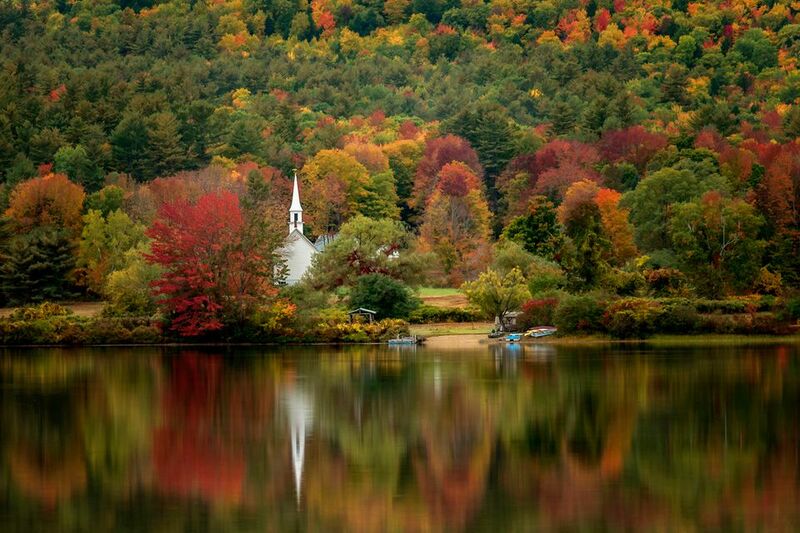 No matter the time of year—New Hampshire makes for an unforgettable vacation. New Hampshire is home to the region's best theme parks for little tykes: Story Land and ​​Santa's Village. Most parents will tell you that age 3 1/2 is the perfect time to enjoy the simple magic of gliding in a swan boat, climbing aboard Cinderella's pumpkin coach, and feeding Santa's reindeer. If you don't have preschoolers, you can still enjoy a New Hampshire theme park escape. At Canobie Lake Park, a New Hampshire fixture since 1902, you'll find antique rides alongside modern marvels like the Untamed steel coaster. New Hampshire is also home to one of New England's largest water parks: ​Water Country. New Hampshire only has 18 miles of shoreline, but it makes the most of the diminutive length of the Atlantic Coast. Hampton Beach is the state's largest sandbox, and it's open to the public free—although parking costs a pretty penny. On summer days, Hampton Beach is packed...and for good reasons. The surf is invigorating but not intimidating. The boardwalk is lined with eateries, arcades, and myriad other amusements. There's always something happening, from free nightly concerts at the band shell to headline performances at the historic Hampton Beach Casino Ballroom. For those staying through the week, there are Monday movies on the beach and Wednesday night fireworks. These activities are in addition to major events like the annual Master Sand Sculpting Competition. In a region with a reputation for superb scenic driving, New Hampshire's Kancamagus Highway (pronounced kanc'-ah-MAU'-gus, but save yourself the trouble and just call it "The Kanc") eclipses other contenders for the title of New England's best byway. This 34-mile route through the White Mountain National Forest is picturesque year-round, and if you're visiting New Hampshire in the fall, it's a must. This Nashua, New Hampshire, allows you to fly like Superman in a vertical wind tunnel. If you've always wanted to skydive, but have a healthy fear of falling out of a plane, this alternative allows you to experience the unforgettable sensation of flying. The activity is safe for almost anyone ages 3 and up. Free beer and gorgeous horses. Need we say more? A visit to Anheuser-Busch's brewing facility in Merrimack, New Hampshire, makes for an affordable outing. The free brewery tour includes the chance to sample several beers for participants 21 or over, but the highlight of the visit is viewing the famous Budweiser Clydesdales. Try to time your trip for the first Saturday of any month, when Clydesdale Camera Day is held. Visitors can meet and take pictures with a Clydesdale free of charge from 1 p.m. to 3 p.m. Yes, there is a castle in New Hampshire, and it overlooks the state's most spectacular body of water: Lake Winnipesaukee. You could easily spend a half-day or more touring Castle in the Clouds and learning of its owner's tragic riches-to-rags story. The rest of the time try hiking to a waterfall and other scenic spots within the 5,500-acre estate and lunching at the Carriage House Cafe, which offers light fare and incomparable lake views. Visiting New Hampshire in the winter? You can still see a castle... an ice castle. Climbing aboard a train is an old-fashioned way to admire New Hampshire's natural wonders, and several memorable excursions await Granite State visitors. The Mount Washington Cog Railway is an engineering achievement that is as impressive now as when it debuted in1869. From the base in Bretton Woods, the train climbs 6,288 feet along the steepest track in America to the summit of Mount Washington, New England's highest peak. Rail fans will also want to check out trips offered by Conway Scenic Railroad or a picturesque and leisurely lakeshore trip aboard the Winnipesaukee Railroad. There are no clear answers as to who constructed these cave-like stone dwellings and astronomically aligned rock formations in Salem, New Hampshire. As the site is more than 4,000 years old, you're guaranteed to be intrigued while exploring the ancient ruins. During the winter, snowshoe rentals are available, so you can even set out to see the megaliths when the temperature drops. Thanks to the lack of a sales tax, shopping in New Hampshire is a bargain—especially at one of the state's outlet shopping centers. Moultonborough, New Hampshire, is home to what may be the oldest store in the USA, so be sure to browse the Old Country Store for tax-free souvenirs when visiting the nearby Castle in the Clouds. New Hampshire's best place to spy moose is the stretch of Route 3 that runs north from Pittsburg to the Canadian border. Known as "Moose Alley," this scenic drive winds past covered bridges, wooded expanses, and a series of pristine lakes that form the Connecticut River's headwaters. Even if a gangly hulking creature doesn't cause you to hit the brakes while driving along the road, you're still in for a wild ride. If you're an art lover, a stop at sculptor Augustus Saint-Gaudens' estate in Cornish is mandatory. Now a national park, the lack of crowds makes the historic home and its sculpture-dotted grounds even more enchanting. You'll have the opportunity to view replicas of Saint-Gaudens' most intricate and important works cast from original molds, learn about the sculptor's life and process, and find inspiration here, as did the many Cornish Art Colony members who followed Saint-Gaudens to New Hampshire. Gorham, New Hampshire, is home to America's oldest man-made attraction: the Mount Washington Auto Road. Although it's a bit of a harrowing drive due to the steepness of the climb, the highway to the tippy top of New England has been traveled since 1861, and it's one of those once-in-a-lifetime undertakings you should consider. Many suggest that it's best to ascend the Mount Washington Auto Road on a guided van tour. That way, you'll remember the spectacular views rather than the white-knuckle driving experience.